A postcard depicting a view of the Sunken Gardens, which were built in 1901 for the Inter-State and West Indian Exposition, a business fair. 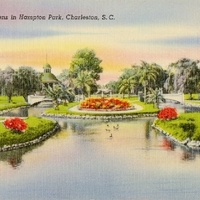 After the fair was over, Charleston established Hampton Park, where the Sunken Gardens remain as a landscaped lake. Original 3 x 5 inch color postcard BY Paul E. Trouche: ACC# SM-00-243, file folder 1 (U.S. blanks), box 10A, Lucile (Mary Lucile) Campbell Collection, UCF Public History Center, Sanford, Florida. Digital reproduction of original 3 x 5 inch color postcard by Paul E. Trouche. Originally created by Paul E. Trouche and published by Colourpicture Publishers, Inc.
"Hampton Park - Charleston, South Carolina." SCIWAY. http://www.sciway.net/sc-photos/charleston-county/hampton-park.html. Trouche, Paul E.. “Sunken Gardens in Hampton Park Postcard.” RICHES of Central Florida accessed April 18, 2019, https://richesmi.cah.ucf.edu/omeka/items/show/6754.